There is an old tree, on the highest branch of which lays a nest. That nest was built with a lot of hard work and dedication by a bird couple, so that their two eggs can grow up comfortably. Mother bird with a heart full of love hatched its two new eggs. The Father bird guarded the nest. When the two nestlings came out, father bird used to go far in search of food and the parents fed the baby birds with their beaks. Parent birds were the only vision, only hope, only guidance for the babies.The ways of world were beyond the sight of the baby birds. Soon the babies had their feathers growing. They turned into fledglings now. Even though they could not fly, they hopped here and there near the nest. 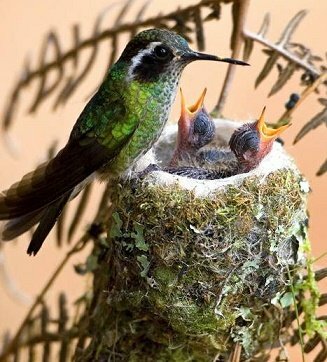 The mother bird watched them from behind, taking care that they are not hurt. She made loud noises, to warn the babies of the danger. Parent birds taught the baby birds how to find food and what to eat. They taught how to fly. The baby birds are young now. They now know how to eat, and how to fly. They were eager to move to new world, try their flight and be free now. Parents hesitated to let them free, but knowing that they need freedom and exposure to a new world, they let the birds leave them. The first little baby bird was extremely eager to fly, It had the thoughts of the new world and was beaming with joy... It jumped from the nest and flew into the air. It was not worried about the consequence of flying so fast. It just flew by, happy and content with its freedom. The next little bird was so shy and timid. It slowly stepped out of the nest, flew to the next branch and looked at parents. They smiled and encouraged with claps of flaps. It flew away after sometime as parents showed a way to its new nest. The parents looked at both of them as they flew by. They are proud of the choices that are made by their babies. But, the nest is empty now. They miss the noise in and around the nest. Only question in their minds is "Will the nest be visited often with the same love and care???"